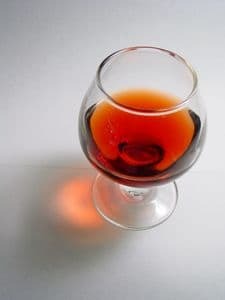 Armagnac is a brandy produced in the Armagnac region of France. Armagnac is an officially demarcated region along with its rival Cognac. Both Armagnac and Cognac are made from the same grapes and are both aged in oak. Where they differ is in the distillation process. Most Armagnac is distilled once in column stills. All Cognac must be distilled twice in copper pot stills. A few Armagnacs also use the pot still method. Armagnac is produced in much smaller quantities than its bigger brother Cognac. More than 15 bottles of Cognac are produced for every one bottle of Armagnac. The Armagnac region or AOC (Appellation d'origine contrôlée) is divided into three districts. Tenarèze includes 40% of Armagnac vineyards, and has a more compact clay soil which produces bigger, full-bodied Armagnacs that take well to aging. Bas Armagnac is the most well known production district. This district encompasses 57% of Armagnac vineyards and has a porous soil that produces a lighter, flowery brandy. Haut Armagnac represents only a tiny percentage of Armagnac vineyards. The limestone soil yields big bodied spirits. The Bas Armagnac region usually produces the most desirable Armagnacs, though if you really like firmer brandies that take a lot of age well, Tenarèze may be your thing. Because Armagnac is distilled at lower alcohol content than Cognac, it retains more of the grape's fruitiness. This, combined with barrel aging can impart a more complex and rustic flavor to an Armagnac compared to a Cognac. Armagnac has several age categories that tell you how long the brandy has slept in the barrel. There are no legal requirements for these categories. Each producer uses them according to his own criteria.